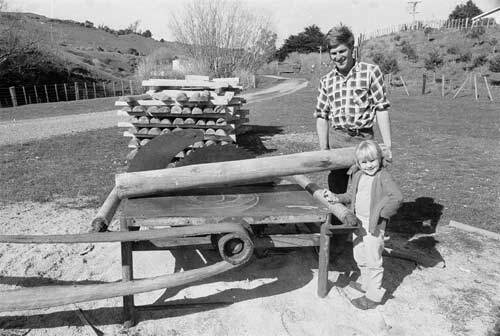 Barry Plimmer, with his daughter Joanna, holds a post made from Radiata pine on his Kapiti coast farm, in 1971. Originally, pine was unsuitable for fencing because it soon rotted in contact with soil. With the development of tanalising to preserve pine, the fast-growing timber became almost universal for fence posts in New Zealand.